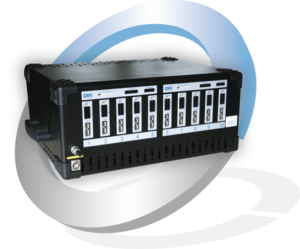 The new ACT0505 desktop test system is configurable by the end user in different channel configurations: 10 x 5A, 5 x 10A, 2 x 25A, 1 x 50A or any combination required by the test regimes. Due to high-speed fiberoptics communication between the channels there is no loss in functionality while using parallel channels. Also in terms of precision the system is raising the bar, with a 1 msec based sampling, control and capacity calculation, hardware controls for both current and voltage and a ± 0.005% FSD accuracy on the voltage readings. This is 10 times better than PEC’s previous offering and 100 times better than competing products in the same power range. Besides these major improvements the system has all best-in-class features and specifications on board from its predecessor, such as 3 automatically switched current ranges, ±0.03% FSD current control, 1 msec rise times, temperature sense per channel….